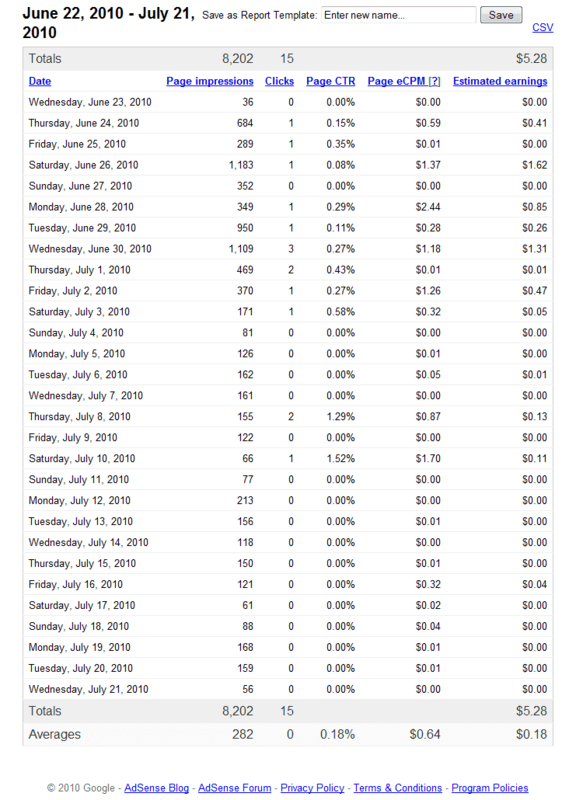 After 30 days of having ads on the right of my blog, I now have data that shows how much money I could make with Google. It was really difficult getting analogous information on the web, so I hope this is helpful to other people. I am going to disclose the exact stats and money here. A whopping $5.28! Click on the image to see the full stats. So the question is: Should I keep the ads or get rid of them. On the one hand, they make me feel like a sellout. On the other hand, $5 is $5 and I didn’t have to add any work to get it. Hmm, Pasha, an engineer who sits in front of me is pressuring me to keep them and write more blogs about mesothelioma. I need to ask Katie and the kids their opinion. You should try to correlate the > $1 days with what drivel you wrote that brought in the ad-clicking-suckers. Then tailor your blog to attract more of them. Brandon, I hope to god I never do that. Based on that comment alone, I think I am going to take them down. Obviously not. Leave them, they are totally non-obtrusive. I never even noticed them. Don’t take them down. You have CTR of 0.18%, which is 10-15 times below average. You need to use your UX expertise to tune these ads to perform better and improve the CTR. I agree, you should keep them (I never noticed them there either). Your blog is very useful and I assume you want to increase your audience. Ad Sense is just another tool that you can use to measure how you are going.